If you received a cancer diagnosis, would you say “thank you?” I don’t think I could. 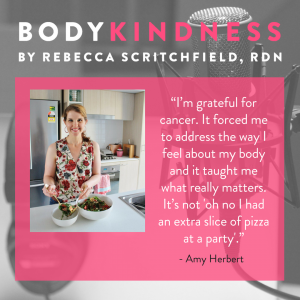 This week’s “body betrayal” guest Amy Herbert is grateful to cancer for helping her discover a whole new appreciation for her body — scars and all. Amy was forever changed by her cancer experience for the better. In this post-traumatic growth story, you’ll learn how she forged this new relationship with her body and why we need to reject unsustainable ideals for beauty, illness, and emotional healing. Amy Herbert is an accredited practicing dietitian who is passionate about helping people reconnect with the joy of eating and movement. She currently works outside the industry but runs a private practice in her spare time, and blogs about food, the non diet approach, and finding gratitude in everyday moments on her blog Thoroughly Nourished Life. Amy lives in sunny Brisbane, Australia with her husband and their dog Penny. When she’s not working or blogging Amy loves reading, running, walking with Penny and Chris, and sharing a delicious meal (and dessert!) with friends and family.